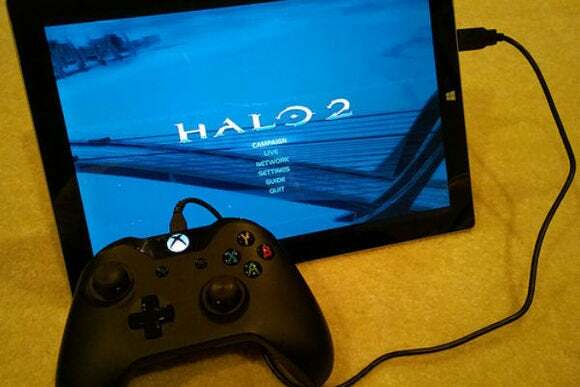 Microsoft has made good on its promise to release PC drivers for the Xbox One controller. The drivers are currently available through the Major Nelson blog, but will be part of a Windows update in the near future. They allow users to plug in the Xbox One controller via MicroUSB, and play any game that had supported the Xbox 360 controller previously. The use of MicroUSB is big improvement over the wireless Xbox 360 controller, which doesn't support a wired connection to the PC. To use an Xbox 360 controller with a PC, users either had to purchase a separate wireless dongle or a separate wired controller. With the new drivers, Microsoft is extending the usefulness of the Xbox One controller, while also establishing it as the de facto standard for gamepad support on PCs. Although Sony's Playstation 4 controller already supports the PC, it requires some extra steps to activate, as Sony hasn't released official drivers. The only bad news is that there's still no way to wirelessly connect an Xbox One controller to the PC. In March, Xbox Director of Product Planning Albert Penello said Microsoft was still determining whether a wireless connection would be possible. Microsoft is also giving some love to Xbox One owners, with a software update that unlocks additional GPU bandwidth for developers. This GPU boost, however, is tied to the unbundling of Kinect from the Xbox One console. “Yes, the additional resources allow access to up to 10 percent additional GPU performance,” a Microsoft representative told Eurogamer, when asked if ditching Kinect freed up more GPU bandwidth. That may explain why Microsoft was reluctant to unbundle its motion-sensing peripheral to begin with; if developers can unlock more resources by ignoring Kinect, they may have even less incentive to support it in their games.